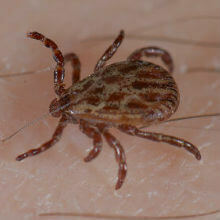 Ticks belong to the same class of animals as spiders (arachnids) and feed on the blood of animals, and sometimes people. While not usually harmful in themselves, due to the way they feed, they can often carry diseases, which can lead to a range of health problems for people who become infected. In the UK, ticks tend to live in woodland or heaths and will wait on vegetation until they see a chance to feed. Most people won’t notice they’ve been bitten unless they actually see the tick and most bites occur on exposed areas like the legs, arms, hairline and scalp. If you’ve been bitten by a tick, or think you may have been, and are experiencing any worrying symptoms don’t delay - see a doctor online now. Our GPs can examine the affected area, diagnose the cause of the issue and if needed, prescribe medication to help treat the problem. What diseases can ticks pass on? Lyme disease: This is the most common type of disease that ticks in North America and Europe pass on and produces a distinct circular rash in the area affected by the bite. It can take a while for symptoms to develop and these usually include issues like headaches, joint stiffness, sensitivity to light and a range of psychological issues, like difficulty concentrating and tiredness. Tick-borne encephalitis: Found mainly in Asia and parts of Russia, this is a type of viral infection that is usually harmless, but in some cases may cause meningitis or encephalitis. Symptoms can vary and may take up to a month to appear. Crimean-Congo haemorrhagic fever: Common to several countries in Africa, Eastern Europe, the Middle East and Asia, this serious infection can cause headaches, joint pain, stomach cramps and vomiting. If left untreated, it can prove fatal, so if you’ve recently travelled to any of these countries and suspect you may have been bitten by a tick - you should speak to a doctor as soon as possible. Louping-ill: This rare condition normally affects sheep in the UK, but can occasionally be passed on to people. Symptoms include a fever, depression, tremors and a lack of muscular coordination. Fortunately, the disease is rarely fatal, but recovery may take some time and if you suspect you may have it, you should see a doctor as soon as possible. Treatment for diseases passed on by ticks can differ, depending on the condition, but if you’re experiencing any of the symptoms described above and suspect you may have been bitten - speak to a doctor as soon as possible.